Floral notes, peach and pear flavors. Great with cheeses and light desserts. Hippolyte Reverdy is one of Sancerres top producers, always consistant and elegant. Look for notes of pear, lime and herbs along with bright citrus notes. The palate is tangy and fresh with more zippy bright citrus notes along with some riper maybe even melon notes. 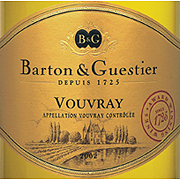 August 2009: high acid, lemon, would go well with fish. Aromas and flavors of ripe apricot, peaches and melon balanced by crisper notes of citrus from grapes grown in California's prime grape growing areas.